When there is at least 1 maximised window, it is visually ambiguous as to which window the menu belongs to. The menu always belongs to the active window, which can be seen by looking at the decoration. However, maximised windows no longer have decoration to save space. 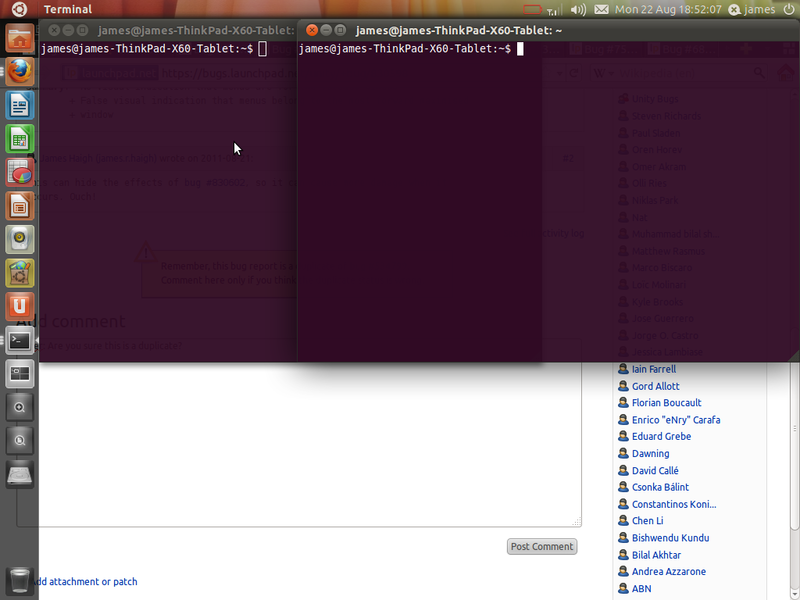 Furthermore, even if the most forward maximised window is not active, it still looks like the menu is part of it. * Draw a thick line or 'shadow' at the top of inactive maximised windows. * When menus are clicked, the active window should increase in brightness. This can hide the effects of bug #830602, so it can cause more damage when it occurs. Ouch! Omer: Are you sure this is a duplicate? Bug #534799 doesn't affect me for unmaximised windows. See the screenshot.